Rev. Dr. Martin Luther King, Jr. Park	MLK Jr. Park is a stunning area that welcomes all. 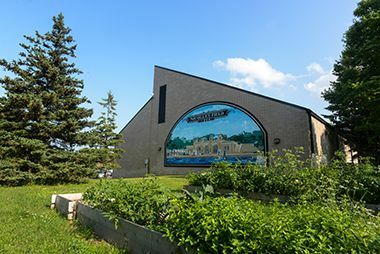 Take a stroll among the trees and visit the recreation center to explore what the park has to offer. The Freedom Form #2 sculpture by Daniel LaRue Johnson represents an outreach of friendship in honor of Dr. King. Name: The park was named Dr. Martin Luther King Park on October 9, 1968 to honor the civil rights leader who was assassinated earlier that year. 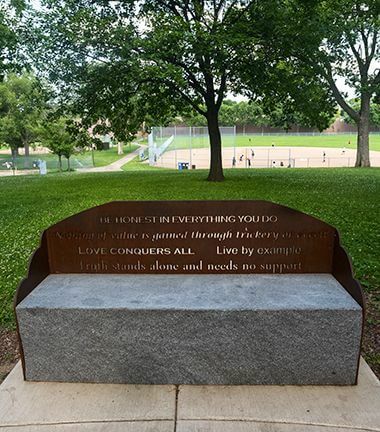 Until then the park was named Nicollet Field for the street that forms the park’s western boundary. 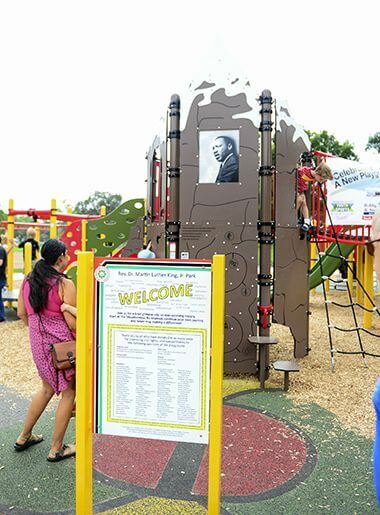 The name of the park was officially changed to Dr Martin Luther King, Jr Park in 2011. Acquisition and Development The land for what eventually became King Park was eyed for park development in the earliest days of the park board. The first petition to acquire land at Nicollet and 42nd for a park was received by the park board in 1889. It was the first request for a neighborhood park south of downtown that wasn’t based on its proximity to water. At that time only Logan and Farview parks were not formed around or next to a body of water. All other properties—from Powderhorn Park with its lake, to Loring Park with its pond, and on to the Chain of Lakes, Minnehaha Creek and Minnehaha Falls, and Riverside Park on the Mississippi—were acquired for the scenic appeal of adjacent water. Preserving places of natural beauty was clearly the priority of the park board in its earliest years. In 1889 the park board’s acquisition priorities were still other water-based properties, from the east and west river banks downstream from St Anthony Falls, to Lake Nokomis (Lake Amelia then), and Wirth Lake (then Keegan’s Lake). Moreover, with the beginning of a deep economic recession in the early 1890s, the park board wouldn’t have money to buy more land for the next ten years, although it would acquire Columbia Park, which included Sandy Lake, in 1892. The first neighborhood parks acquired in south Minneapolis not adjacent to water were Bryant Square in 1904 and Stewart Park in 1911, much of which was donated. Both were much nearer downtown than King Park. The park board first designated for acquisition the land that became King Park in 1915. (At the same time, the board designated land for Bottineau Park in northeast Minneapolis.) Just over 21 acres of land were purchased for a little more than $70,000 on March 15, 1916, at which time the new park was named Nicollet Field. The cost of the land was assessed to property in the neighborhood. The purchase was not without controversy. Even though Bottineau Field in northeast Minneapolis was purchased about the same time, the Northside Improvement Association protested the acquisition of Nicollet Field, believing that the park board had already devoted too much of its resources over the years to acquiring parks in the southern half of the city. A plan for the development of the field was included in the 1916 annual report. That plan included a field house, grandstand, huge wading pool, terrace seating for a baseball field, and twelve tennis courts on the north edge of the park. Development of the land began gradually. In 1917, some of the houses on the property were sold, which paid for small improvements, including some grading, a tennis court and a skating rink. Park superintendent Theodore Wirth noted that the rink was well-attended that winter, in part because it was in a district “not previously accommodated” with a rink. One house in the park, on the corner of 42nd Street and Nicollet, was not sold, but “put in good condition” and rented to the man hired to be the park keeper. The next spring a small temporary ball field was built near 40th Street and in 1919 the park board filled the low northern end of the park with nearly 15,000 cubic yards of fill. That fill enabled the park board to build a better baseball field, with a backstop and benches for players, for the summer of 1920. But the park still had not been developed according to Wirth’s 1916 plan and a recreation center had not been built. In late 1922 the park board received a petition from residents near the park for further improvements, asking the board to create a new plan for the park that included a shelter and toilet building of “moderate cost.” Property owners in the neighborhood would have to pay the costs of park improvements through property assessments, and they apparently were unwilling to foot the bill for the more elaborate plans that Wirth had originally created. Wirth’s new plan for the park met with the approval of the neighborhood and the park board in early 1923, but the price tag was then still in excess of $200,000, the most expensive neighborhood park improvements up to that time in Minneapolis park history. Part of the reason for the cost became apparent later that year when the park board approved draining the park of water and purchasing fill to bring the park up to grade. Like most property acquired for neighborhood parks, the land was low-lying and often flooded. In short, Wirth called it a swamp. A shelter was built in 1924, but even then Wirth warned that additional grading and filling may be needed as the original fill settled. He also noted that at a cost of $25,000, the shelter built in the park was the most expensive ever in a Minneapolis park. The expense was due to difficulty building a foundation for the shelter on wet soil. Ultimately the shelter had to be built on piles to keep it stable. Although many features of the park Wirth had first envisaged, such as a field house and grandstand, were scrapped as too expensive, the park did get the huge wading—and fly-casting—pool that were in Wirth’s first plan. The first playground equipment was installed in the park in 1926. Baseball was always popular at King Park, perhaps due to the park’s proximity to the city’s professional baseball stadium one mile north at Lake Street and Nicollet. During the height of the Great Depression, when the park board had almost no money to maintain parks, General Mills donated money to keep the baseball field at King Park in playable condition, an indication that the baseball field there was one of the most important in the city. 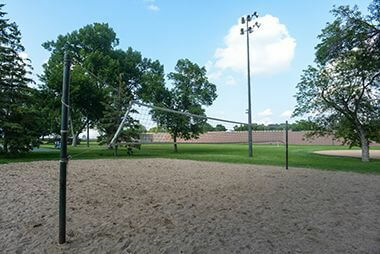 By the end of World War II, Nicollet Field Park was one of the premier recreation parks in the city. 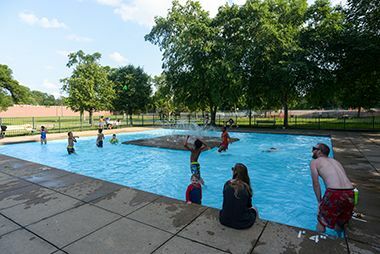 When the park board began its first year-round recreation programs in 1945, Nicollet Park was one of four city parks chosen for expanded programs, along with Logan Park in northeast, Loring Park near downtown, and North Commons in north Minneapolis. And the next year it was one of five parks to be equipped with lights for after-dark play on playing fields and playgrounds. The others were Logan, Loring, Folwell and Sibley. A major addition to Nicollet Park occurred in 1950 when construction was being planned for a new 17,000-seat stadium at The Parade. 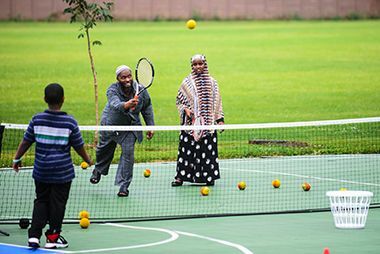 The new stadium required the space occupied by the tennis center there, so the park board decided to move it to Nicollet Park where the twelve existing tennis courts were heavily used. The building that had housed the tennis center at The Parade was moved to King Park in the fall of 1950. The existing concrete courts were repaved with a bituminous material and bleachers were built around two courts to serve as “exhibition” courts. The new tennis center hosted the National Public Park Tennis Tournament in 1953 and again in 1961. Throughout the 1950s, summer playground programs at Nicollet Park were among the most heavily-attended in the city’s parks. 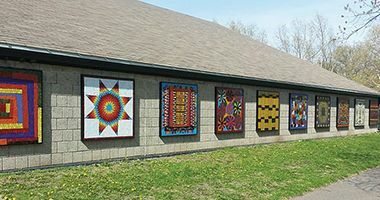 By the early 1960s, the popularity of Nicollet Park designated it for renovation and the addition of a new community center. The funding for those improvements came from an unusual source and at a steep price. In 1962 the Minnesota Department of Transportation paid the park board $372,000 for about 2.6 acres of Nicollet Park that were needed for the construction of I-35W. 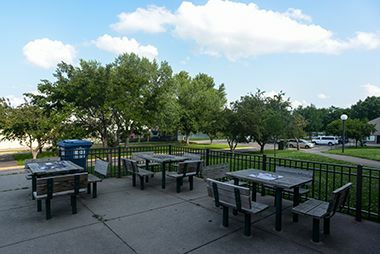 At the request of the neighborhood, those funds were applied to the construction of a new recreation center at the park and the renovation of the city-wide tennis center. Both projects were completed in 1968 about the time that the name of the park was changed to honor Dr. King. 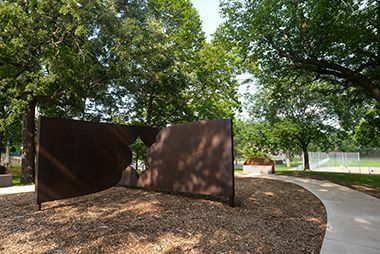 In 1970 New York sculptor Daniel LaRue Johnson donated a sculpture “Freedom Form #2” to the park board for placement in the park in honor of Dr. King. The recreation center, playing fields and playgrounds were all updated and a gym was added to the center in 1992. The playing fields were upgraded and new tennis courts were constructed in 2002. 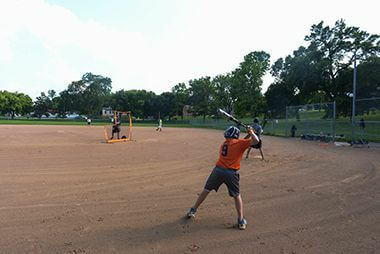 The baseball field in the park received special attention in 2007, when, with the support of the Minnesota Twins Community Fund, the field was rebuilt. 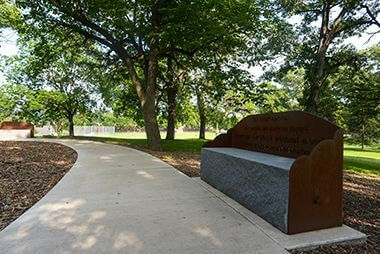 In 2011, to celebrate the 48th anniversary of Dr. King’s “I Have a Dream” speech, Johnson’s sculpture was relocated and the area was landscaped to highlight the sculpture. The sculpture was repaired and fortified in 2016. 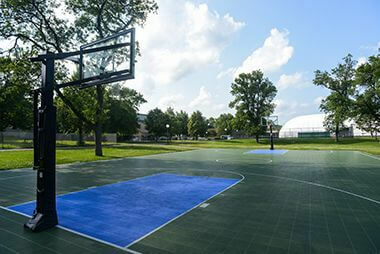 In 2012, the basketball court was resurfaced in blue and green and new hoops, poles, backboards and benches were installed. 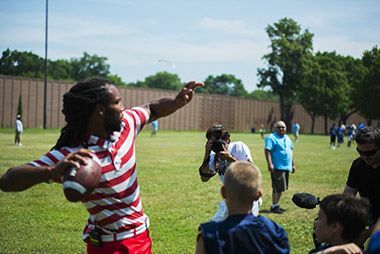 The project was paid for with a donation from Arizona Cardinals wide receiver Larry Fitzgerald, Jr., who grew up in Minneapolis. 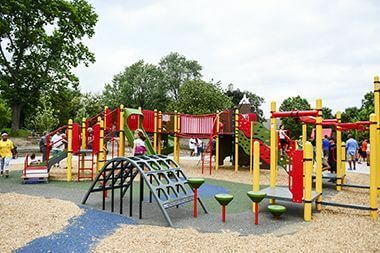 In 2015 a new playground opened. It highlights numerous African-American inventors and their contributions to modern society. In 2016 solar panels were installed on the roof of the multipurpose room. History through 2008 written by David C. Smith, with updates from 2009 to present written by MPRB. The civil-rights themed playground was dedicated at the 2016 Beloved Community Celebration.. Dedicated at the Celebrate Our Beloved Community event. Cool off in the summer at the Rev. Dr. Martin Luther King Jr. Wading Pool. See our other wading pool locations..
Rev. 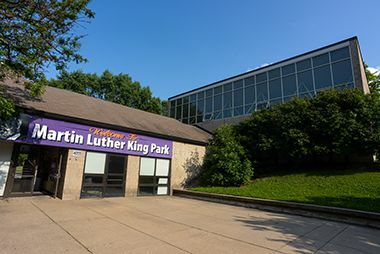 Dr. Martin Luther King Jr. Recreation Center offers programming year-round. Enjoy a shady stroll along the park's paved walking trails. One of the park's standout features is its sculptures and murals. The sculpture by Daniel LaRue Johnson represents an outreach of friendship in honor of Dr. King.